In recent days and weeks, Iran has found itself in the news on a fairly regular basis, particularly now that it appears to be making overtures of "peace". Iran is often overlooked as an energy producing nation, while most people are aware that Iran is a member of OPEC, they are not aware of the significance of Iran's oil and natural gas reserves. Hopefully this posting will put Iran's place in the energy world into context. Let's open with some background information on the country. 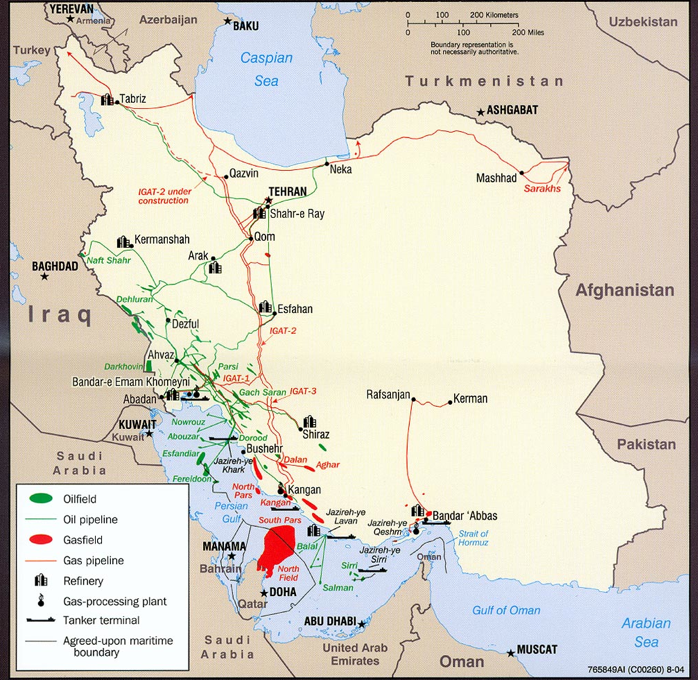 Iran is located along the north shore of the Persian Gulf, a very strategically important geographic location since the country is in partial control of the entry to the Gulf of Oman, the narrowest part of the access and egress from the Persian Gulf. Iran is not an Arab county, the majority of Iran's population of 77,891,000 people are Persian. Iran has a very young population; the median age of both males and females is only 26.8 years compared to 36.9 years in the United States. Iran's economy relies heavily on the oil and natural sector which provides the majority of government revenues. Iran suffers from one of the world's highest unemployment rates (139th out of 199 countries) with 13.2 percent unemployment in 2010. Surprisingly, Iran's government is one of the most fiscally responsible in the world, in 2010, Iran's government ran a budget surplus that reached 6 percent of GDP (11th place in the world) and public debt is only 16.3 percent of GDP, enviable by any standard. The combined field was discovered in 1990 by the National Iranian Oil Company (NIOC), the second largest oil company in the world after Saudi Aramco. It covers an area of 9700 square kilometres of which 3700 kilometres are situated in Iranian territory. The field is part of the north-trending Qatar Arch with most of the gas trapped in Permian-Triassic formations. 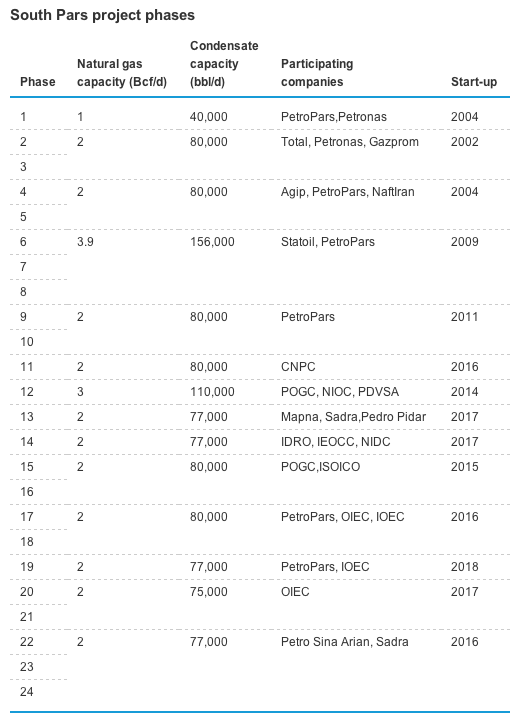 The total reserves for the field are estimated to be around 2000 trillion cubic feet (TCF) and it contains an additional 50 billion barrels of condensate. With in-place reserves of 360 billion barrels of oil equivalent, the field is larger than the world's largest oil field, Ghawar (170 billion barrels of oil-in-place) located in Saudi Arabia. It is anticipated that the gas recovery factor is about 70 percent resulting in total recoverable gas reserves of 1260 TCF. Using a 70 percent recovery factor results in the combined field containing 19 percent of the world's total gas reserves. Interestingly enough, the fields also contain the world's largest reserves of helium totalling 10 billion cubic metres or about 25 percent of the world's total helium reserves. Iran's proven natural gas reserves in this one field alone are nearly twice that of the entire United States. 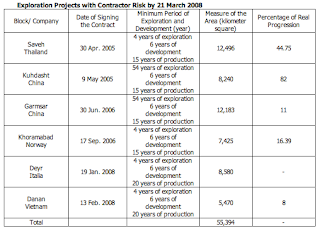 In 2009, the National Iranian Oil Company announced that China National Petroleum Company signed a $4.7 billion contract to develop Phase 11 (out of 29 total phases) of development of the South Pars field. CNPC replaced Total as a partner; Total had signed a memorandum of agreement to develop the field in 2004, however, those nasty international sanctions interfered with Total's ability to develop the field. 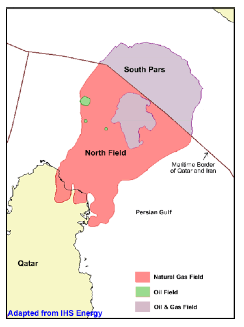 Iran had become increasingly concerned that a portion of their natural gas reserves were being competitively drained by Qatar. It's interesting to see that NIOC also partnered with Russian, Brazilian, Vietnamese, Italian and Spanish oil companies for various exploration projects throughout Iran. In 2011, Iran produced roughly 5.4 TCF of marketed natural gas and consumed an estimated 5.4 TCF. Of the 7.9 TCF of gross natural gas produced, 1.2 TCF was reinjected into oil reservoirs as part of Iran’s plan to increase crude oil production through the use of enhanced oil recovery (EOR) techniques. Even with the massive and growing output from South Pars, it is unlikely that Iran will increase its exports of natural gas. 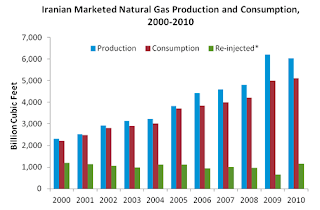 In fact, despite having the world’s second largest natural gas reserves, Iran imported about 0.7 BCF/day of natural gas from Turkmenistan to satisfy demand in the northern part of the country. 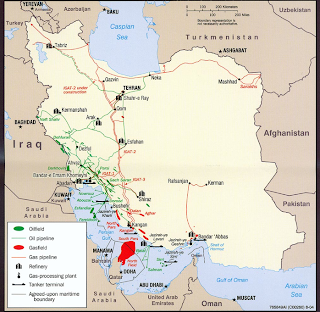 As an aside, in January 2011, Iran's Petroleum Minister announced the discovery of a new onshore natural gas field located in southeastern Iran near Assaluyeh in Bushehr province. 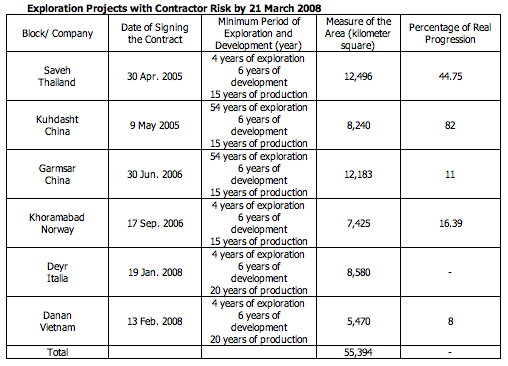 The field contains recoverable gas reserves of 7.4 TCF and an additional 7.7 million barrels of condensate in place. One can readily see from this posting that Iran is sitting on a very strategic resource. The combination of huge reserves of both oil and natural gas may well make Iran a very, very tempting target for military intervention in the future. In this case, however, the issue is complicated by the presence of both Chinese and Russian economic interests in Iran’s natural resource base. Thanks for a very interesting post. I'm teaching at the College of the North Atlantic -Qatar - a Canadian college - and periodically check your blog, which I think is based in the federal Riding of Malpeque, PEI, a space I know well! I am very glad I checked in today! Great information about Qatar's somewhat tense relationship with their Gulf neighbour Iran. It's certainly more than we would see in the newspapers here. 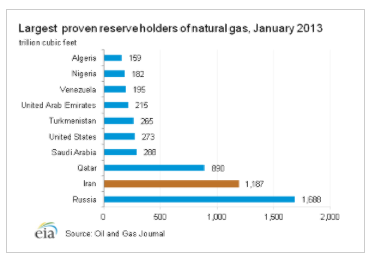 Qatar always uses the fact that they have the 3rd highest natural gas reserves in the world, but never mention that #2 is Iran. Next week we have the World Petroleum Congress (www.20wpc.com) here in Doha and it will be huge event. Nice to know this ahead of time! Thanks! I hope it's not out of turn to inject some politics into this discussion (and I love fact-based discussions), but I don't think Iran is going to want to drop an H-bomb onto its burgeoning commercial relationships. Iranian leaders have a fast-growing population to provide for (and fear), so development is probably their highest priority. We have actually met. Would you please email me at viableopposition@hotmail.com? Thanks. You are right. I believe that their growing domestic dependency on their massive natural resource will force them to develop commercial agreements with outside nations...one way or another. I certainly hope Iranians will find ways to navigate the greedy West trying to snuff them into submission of their Natural resources for the use of North American and UK needs. They need to ally themselves with Russians and Chinese more closely and stay alert to the sophisticated maneuvers of the North American and West European Multinationals, which are truly parasitic and demeaning to the native people of the Middle East. Interesting post! Do you also have data on the North Eastern Part of the Philippines where the Pacific Ocean sits? It has been rumored to have one. Yes, why I haven't read anything in Philippines about natural gas. Or does it hid for political reasons. the issue is complicated by the presence of both Chinese and Russian economic interests in Iran’s natural resource base. Great article, wish you would update it to reflect the changes that have happened since, both politically and economically. Life in Metropolitan America: Is it Improving? Is Corporate America Paying Their Fair Share?